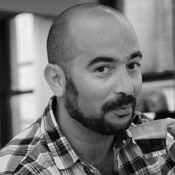 Nitzan Hermon is an art director, creative technologist and researcher. He is an alumni of the first ever museum-led incubator, New INC – and currently researching design for AI, IA (intelligence augmentation) and cognition. As a creative director, Nitzan has produced award-winning work for Wallpaper*, Le Meridian and Percolate. His work has been featured in international press and various publications; The Guardian, Gestalten, The Atlantic and Desktop Magazine. As a collaborator to The Lubalin Center of Design and Typography Nitzan promotes design and culture initiatives. His approach is research-driven, focused and accurate. Through deep understanding of the stage and collaborative ideation he is able to focus on the core of the problem and produce a solution that bridges the needs of the business and the user. Designs are not hardcoded and the logic is always transparent. Execution strives to be as simple and scalable as possible.